Matt Martin, Adam Lord and Simon Blackburn outside the newly built home. Being able to say he built a house was something Adam Lord would not have dreamed of when he signed up to He Toki in 2011. But this year working for McKenzie Builders, Adam has officially completed his first build. 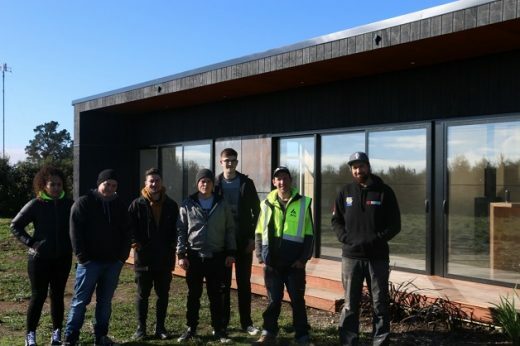 While Adam (Ngāi Tahu, Tuwharetoa, Te Whānau a Apanui, Ngāti Porou, Ngāti Kahungunu) had been involved in previous building projects, this was his first time leading a house through the entire process. The house is located just outside of West Melton and was described as a trickier build by Adam. “The house was an architectural build that was to a very high standard. The house also had some very intricate design elements which made it tricky at times” says Adam. “It was a big learning curve on this job, once you do an architectural build you realise how long all the final details can take,” he says. “Having those house finishings done to perfection is the key thing to having a successful build and happy client,” says Adam. When asked how it feels to look at the home he built Adam said he didn’t really know what to say. “It just feels so rewarding to see it finished,” he says. Adam was part of the first intake into He Toki in 2011. 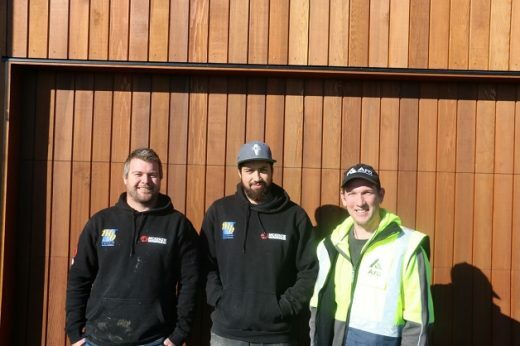 He Toki was born out of the rubble of the Christchurch earthquakes and since its inception it has seen over 1200 people complete pre trades training qualifications. Adam says the He Toki programme was a great step to helping him achieve his career. “While I was doing He Toki I was also given some work experience with McKenzie Builders and that helped me get where I am today,” says Adam. When asked why McKenzie Builders carried him on as a builder, Adam laughed and said I just kept turning up and was pushing the boss for a job. “You just have to keep pushing and prove to them you can do they job,” he says. This was advice he reiterated to a group of He Toki students who went to see the home Adam had created. Adam said you need to show the boss you are passionate and hardworking. Adam with a group of He Toki students at the house he built. After Adam’s persistence McKenzie Builders offered him an apprenticeship and from there he has moved up the ranks to become a foreman. He said to the He Toki students that if you work hard then in about 5 or 6 years you will be able to be independent and doing your own site like this. Adam was also very complimentary of McKenzie Builders saying they were a great place to work and learn. He Toki can provide trades training and apprenticeships programme for Māori and the programme brings together the strengths, knowledge, expertise, capability and networks of Te Rūnanga o Ngāi Tahu, Te Tapuae o Rehua, Hawkins Group and Ara Institute of Canterbury. If you would like more information on He Toki call 0800 HE TOKI (438 – 654).